Profile: Born in Bregenz, Austria, I immigrated to South Africa, with my parents, at age five. I went to trade school, majoring in woodwork and technical drawing. After school, I enrolled at the University of Port Elizabeth, where I read and received an honours bachelor of science degree in quantity surveying, enabling me to enter into professional private practice as a construction cost consultant/analyst. Throughout my student years, I was constantly exposed to both woodwork and metalwork in dad’s workshop, and came to enjoy creating small projects as a hobby. Being a keen outdoorsman, dad built a custom hunting/camp knife for me, and since that time I was hooked on the idea of designing and building my own custom knives. 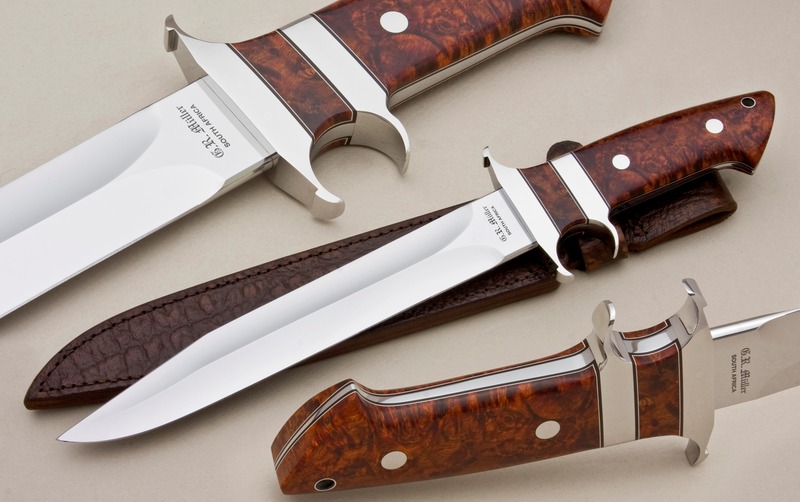 I was introduced to the late Rob Brown, a world class knife maker, and with his assistance and guidance, I joined the Knifemakers’ Guild of Southern Africa in July 2002. My first knife was sold in January 2001. My aim in knife making, is to create knives of the highest quality and value for money, that I am capable of, and constantly strive to improve my skills and product. I make both fixed blade knives, which include hunters, daggers, fighters and utility knives, as well as folding knives. Customers can either select from a range of existing knife designs, or when requested, a design meeting specific requirements. Currently I am following my passion, and focusing mainly on fixed blade knives. Handle materials used, depend on customer preference and availability. I work with both stainless and carbon knife steels, depending on customer preferences. For my folding knives I prefer to use stainless Damascus steels. Currently I am a full time knife maker, running a one man operation. My residence and workshop are located on a 5 Acre plot on the outskirts of Port Elizabeth, South Africa. Sub-hilt fighter with full tapered tang, size 370mm overall and 230mm blade. Ex 6mm Thick Bohler N690 stainless steel, grade 303 s/s coachwork, Arizona Desert Ironwood handle and Formica decorative liners. Buffalo leather sheath.